Governor Christie slashed millions of dollars promised to public schools last year. Our district lost teachers. Today the Star-Ledger announced that the Governor is lending over a quarter billion dollars to a failed casino project in Atlantic City. "The state will put its efforts and its credibility and its money where its mouth is." 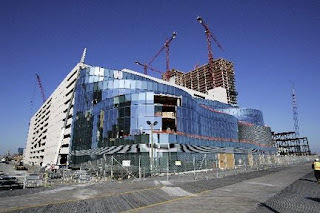 We, the state of New Jersey, are now a 20% partner in the Revel Hotel and Casino. Our state mouth is sucking on a shell of a building. Photo by Mel Evans, Associated Press. Schools don't produce immediate money! They don't help keep the downtrodden poor, and they certainly don't have an efficient economic model! After all each year you give thousands of dollars away to people and see no tangible results, no proof that these thousands of dollars have been spent for any purpose at all. What a terrible waste of money education must seem to the NJ governor. Shame on him. New York's priorities too. I just got my W2. I work at least 80-100 hours per week and didn't make $40K. I also buy my own lab chemicals because my school won't. The gov just announced that freezing teacher salaries will solve the state's budget woes. It is a bit depressing--he's pushing to siphon money away for charter and private schools as well. He strikes me as an odd duck, really--I almost feel sorry for him. He just seems so unhappy. I just hope he doesn't do too much damage in the long run. He may be a national problem in 6 years. Maybe (just maybe) Cuomo will make better choices than his counterpart across the Hudson. On the plus side, isn't teaching science fun! As the state that passed legislation for the lottery to "save education", I can't judge. But I guess since I voted, I can complain! Wow. Who knows what goes through the minds(?) of those who run our government. And to tag on to what you guys said, It is at least nice to be able to do something I am passionate about. Even if (it seems) our legislators don't really give two cents for it. We're blessed, truly blessed. Not all teachers enjoy teaching, true (nor do all docs enjoy medicine) but for those who do, each day can be as wonderful as it is long.